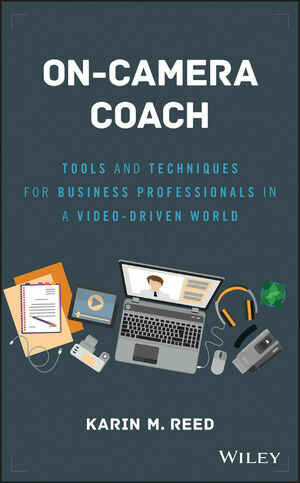 On-Camera Coach is your personal coach for becoming great on camera. From Skype interviews and virtual conferences to shareholder presentations and television appearances, this book shows you how to master the art of on-camera presentation to deliver your message clearly, effectively, and with confidence. Fear of public speaking is common, but even the most seasoned speakers freeze in front of a single lens—being on camera demands an entirely new set of skills above and beyond the usual presentation to an audience you can actually see. It requires special attention to the way you move, the way you speak, and even the way you dress. This book provides the guidance and tools you need to ace it every time. Video is powerful, and it is everywhere; corporate YouTube channels, webinars, virtual meetings, TedTalks, and more are increasingly turning the lens on those who typically remain behind the scenes. This relatively recent trend will continue to expand as media plays a larger role in business, and the ability to appear confident, authoritative, and polished is becoming a necessary job skill. This book shows you everything you need to know about being on camera, from preparation through presentation and beyond. The lens captures everything—the awkward pauses, the nervous fidgets, poor posture, and every false start and mistake is captured for posterity. Is that the image you want to present? You want to get your message across and be heard; to do that, you must portray authority, energy, and confidence—even when you don't feel it. On-Camera Coach provides the expert instruction and insider secrets that help you make your message sing. KARIN M. REED is the CEO of Speaker Dynamics, a communications firm based in Raleigh, North Carolina. She has made a career out of communicating on camera as an award-winning broadcast journalist, spokesperson, and executive communications specialist. Karin has been a trusted trainer and consultant for organizations ranging from early-stage start-ups to Fortune 500 companies. She empowers her clients, whether they come from the C-suite or the sales force, to speak with ease to any audience on any platform. Her methodology is based on more than 20 years of personal presentation prowess and the understanding that the best speakers are steeped in authenticity.